The Alexander Nevsky Monastery was built on the place where the Black River (it is called Monastyrka River) enters the Neva. This monastery was named af­ter the great warrior Alexander Nevsky, the Prince of Novgorod (1220-1263). In 1240 on the Neva bank the battle between Russians and Swedes took place. The winner was Prince Alexan­der. He obtained the name of Nevsky and was canonized later. St Alexander Nevsky became the patron of St Pe­tersburg. In 1710 Peter I ordered to establish a monastery named in honour of the Saint Trinity and Saint Alexander Nevsky. He chose this place because of a legend. Accord­ing to the legend the famous battle between Russians and Swedes took place there. The true place was where the River Izhora enters the Neva. Peter I knew the fact but he wanted to found a monastery in honour of Alexander Nevsky in St Petersburg. On the 25th of March 1713 a wooden church was con­secrated and the first monks appeared. The project of the monastery was made by the famous architect Domenico Trezzini. Peter I wrote on the project: “In the name of God it should be done according to that”. The ensemble of the monastery consisted of churches, cells and Metro­politan’s chamber. These structures were placed in the shape of the Russian letter “П” with churches in the cor­ners. On the 30th of August 1724 the relics of St Alexander Nevsky were brought from the town of Vladimir. Peter I took part in this great ceremony. Domenico Trezzini made the design of the first temple, but the construction was prolonged and finished only in 1753. Soon some cracks appeared on the walls of the ca­thedral. It was dismantled to the basement between 1753 and 1755. 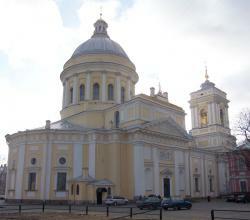 Between 1776 and 1790 on its place the new cathedral was erected after the design of the architect Ivan Starov. The Holy Trinity Cathedral was designed in the style of Russian classicism. The Metropolitan’s chamber was designed by the ar­chitect Mikhail Rastorguyev. It was constructed between 1756 and 1759. It was built on the western side of the square. It is an outstanding work of Russian baroque. The main entrance to the monastery is embellished with a graceful gate church. This church was built after the project of the architect Ivan Starov between 1783 and 1785. There are several graveyards on the territory of the monastery. Lazarevskoye Cemetery is the oldest one in the city. It was founded in 1716. It is situated to the left of the main entrance. Natalya Alexeyevna, the sister of Pe­ter the Great, was buried there. Since that time many famous people were buried there, such as the scientist Mikhail Lomonosov and the architects Andrey Voron­ikhin, Andreyan Zakharov and Carlo Rossi. Tikhvinskoye Cemetery is located to the right of the main entrance. It was founded in 1823. There are graves of many people of art and science. The composers Mikhail Glinka, Pyotr Tchaikovsky, Modest Moussorgsky, Nikolay Rimsky-Korsakov, the writer Fyodor Dosto­evsky, the artist Alexander Ivanov, the architect Vasily Stasov, the sculptor Pyotr Klodt and other outstanding people were buried there. To the left of the main gate there is a two-storey build­ing, built after the project of the architect Mikhail Rastorguyev. There are two churches in this building. The upper church was erected in honour of Alexander Nevsky. The lower church was constructed as the Church of the Annunciation between 1714 and 1722. Since the first days of the foundation of St Petersburg a burial vault of the famous persons has been kept there. Ivan Betskoy, Count Ivan Shuvalov, Generalissimo Alexan­der Suvorov and others were buried here. Some grave­stones were sculptured by Ivan Martos and Fyodor Gordeyev. In 1720, a typography was founded in the monastery. Later the Theological Academy was opened here. It’s still functioning today. In 1797, at the time of the Emperor Paul I the monas­tery got the status of the first-rank “Lavra”. Under the apse a silver shrine was put. There was a part of Saint apostle Andrey Pervozvanny’s relics. Many outstanding masters took part in the decoration of the cathedral. The iconostasis of the temple was made of white Italian marble. It was created by the Italian sculptors brothers Pinketti. The icons of the iconostasis were painted by the professors of the Academy of Fine Arts. Before 1934 there was a famous icon created by Pe­ter Paul Rubens “Resurrection of Christ”. That icon was bought by Peter I in Holland. Then it was taken from the collection of the Hermitage for the cathedral by Cather­ine II. The Holy Trinity Cathedral is the most majestic temple of the monastery. The temple is crowned with a powerful dome. The cathedral was consecrated on the 30th of August 1790. The same day the relics of Saint Alexander Nevsky were brought to the cathe­dral.